In this informative article, Tim Bednall, sales & marketing manager for Wood Automation & Control’s Systems Division, highlights the depth of expertise and talent that UK manufacturers can draw upon to ease the path to automation and, in turn, greater productivity. The UK’s manufacturing base is operating within an unusually challenging environment at present, as a result of both potential political change and the fact that some export markets are less than buoyant. Combine these issues with the fact that the UK still lags behind in the productivity stakes, when compared to other G7 nations, and it’s clear that we need to embrace the technologies that will enable UK manufacturing to be competitive on the world stage. Here in lies the dilemma: outside of the automotive sector, the UK generally performs poorly in the uptake of automation and robotics with just an average of 74 robots per 10,000 employees. This is much lower than many of our European cousins, and around a quarter of the total for Germany alone. There are undoubtedly many reasons why this is the case; however, recurring themes include a lack of understanding of how automation could transform a manufacturing process, and also a fear of complexity and technical risk. Despite the overall statistics, there are great examples of UK manufacturers embracing high levels of automation and making it a key element of their manufacturing processes. Other companies have introduced a lower level of automation, often for relatively simple pick and place, handing or assembly tasks. However, there is still a majority missing out on the potential benefits that automation can deliver. This is especially true of those who may perceive their applications to be too difficult or overly complex, as there are several, often different technologies involved in the manufacturing process. For those concerned about complexity or technical risk, the productivity and reliability of our automotive sector installations should be seen as a shining example of how large multi-technology projects can be successfully implemented. 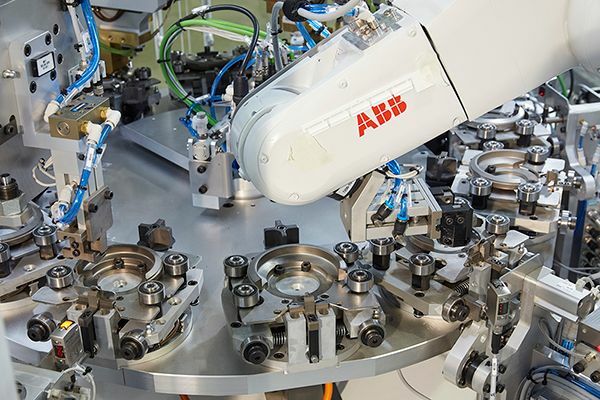 It’s not uncommon for a car manufacturing line to have several hundred robots, all of which need to operate in a complex sequence using a wide range of different technologies, and perform these tasks with high overall efficiency levels on a 24/7 basis. Outside of the automotive sector, there will be few applications that will require such high levels of mechanical automation combined with sophisticated control software and robot programming. The resources, skills, and tools used to achieve these world-class manufacturing lines are all readily available to other UK companies considering robots and automation as part of their manufacturing process. Clearly, if technical risk is seen as the barrier to automation, then this needs to be highlighted at the earliest stage, and there are several ways in which this can be addressed. One option is ATG’s “Virtual Commissioning” software, where the complete cell or production line is developed in a virtual environment, enabling the customer and their engineers to see exactly how the system will function. This allows specific events, such as error messages and recovery procedures to be tested as it utilises the actual Robot, PLC and HMI codes and is integrated into the 3D CAD of the entire system. In addition to addressing technical risk, virtual commissioning can save significant time getting products to market, especially on larger scale projects, when compared to the traditional build, develop and commissioning route. This “Digital Twin” approach, provides other benefits such as Operator and Maintenance training, without interfering with production, and the validation of the software and hardware design within regulated industries. The production of a “Proof of Principle” system is a more traditional “Hands-On” approach to evaluating automation concepts and provides the opportunity to trial grippers, parts feeders, fixture design, and robot movements, etc. As for every sector, an aging workforce, and in certain areas a current skills shortage, means that apprenticeships and ongoing training are essential if, as a country, we are to retain the skills needed to design, develop, install and maintain the automation systems which will provide the competitive advantage that the UK needs. Recent initiatives that focus on science, technology, engineering and maths (STEM) will help encourage more young people to embark on a career in engineering, but this needs to be bolstered by both manufacturers and robotics and automation specialists ensuring that they bring on their own home-grown talent. The 30 apprentices currently training within Wood Automation & Control’s U.K Division’s own IET accredited academy, will acquire skills in a broad range of automation disciplines through a combination of hands-on and academic courses. This way, the company will ensure that the skills and innovation required to deliver tomorrows automated production systems will be readily available to assist UK manufacturers. Related Post Proof of Principle: Why?